Terry Mansion Gardens - Website of littlerockgardenclub! The gardens at Terry Mansion are a continuing project for the Little Rock Garden Club working in conjunction with the Little Rock Parks Department and the Arkansas Arts Museum. In 2000, LRGC established a Butterfly Garden in the northwest corner of the property. In addition to the Butterfly Garden, the Little Rock Garden Club facilitated the grounds being recognized as an Urban Arboretum. LRGC removed 15 hazardous trees and planted over 30 new trees, all of which have been numbered, labeled, and mapped with location and condition. Brochures on the Butterfly Garden and Urban Arboretum are available to the public. A pdf version of the Urban Arboretum map and brochure are available by clicking here. 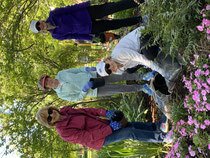 LRGC members actively garden the Terry Mansion grounds as volunteers on a weekly basis. Members change out the flower beds seasonally, maintain the planting beds, and take care of general garden maintenance. The grounds received the City Beautiful Award in 1997.